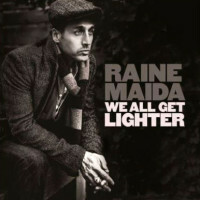 Raine Maida- We All Get Lighter - Gordon Lightfoot Book, Music and More! While less reliant on spoken word, Maida’s sophomore solo album boasts much of the same urgency. Recorded with his wife, Chantal Kreviazuk, who provides piano accompaniment and backup vocals, songs like the driving “S.O.S.” promote social action while the Radiohead-like “This is Gonna Hurt” is a stirring cautionary tale. Best of all is the elegiac, horn-laden “Montreal,” about standing strong in the face of adversity. An outspoken supporter with Kreviazuk of the War Child charity, Maida is admirably putting his principled beliefs into song.